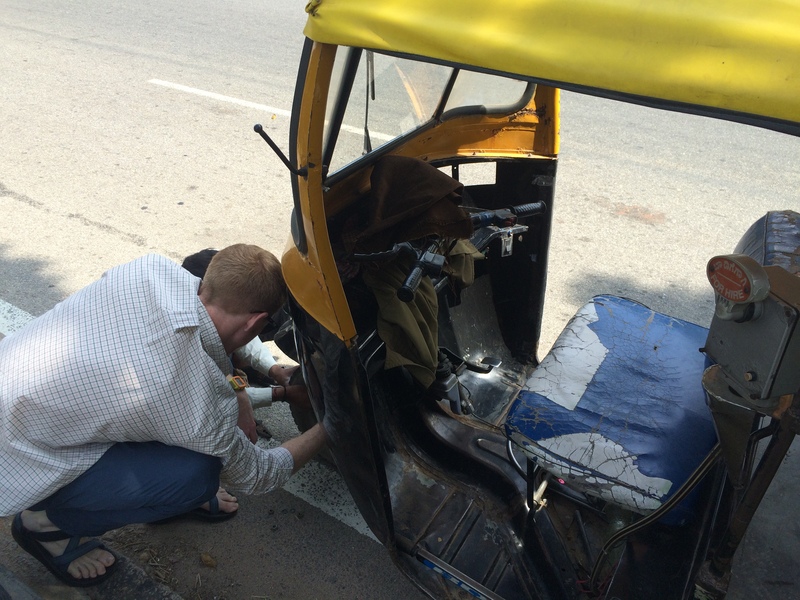 I’ve been driving since I was fifteen (I know, I know–SC starts young), so coming to South Asia was a huge difference for us because we gave up driving for merely riding. Our choice transportation so far has been autos. Now when you hear the word auto you might start picturing an automobile in your mind. Erase that picture very quickly, and replace it with a golf cart. Now imagine a golf cart with only one wheel in the front, and I think you’ve got a decent idea. The word auto itself can be a bit ironic for me because auto makes me think of being autonomous, self-sufficient, free-bee. In actuality autos are hit and miss for us. Sometimes they’re everywhere and sometimes there are none in sight. Sometimes they stop for us, and sometimes they stop and then just say no and drive off. We take the same route every day for language class, so it only took us two days to realize what our driver should be charging us for his services. They have meters in their vehicle that charge by distance, but we learned not to ask for the meter initially…if you ask, they assume you don’t know what you’re doing and proceed to tell you “no me ter–meter is broken” (which always baffles me if I can see the numbers working perfectly fine…they must think our vision is also affected by our language barrier.) Sometimes the men take one look at our skin, or listen to us try to impersonate their accents, and immediately charge us 3 times what the meter price is. If i’m tired, hungry, or have an upset stomach and want to go home, I don’t argue–I just understand that I’m a foreigner and I pay extra. But sometimes I just get mad. Like the time I actually knew how to get home (for the first time!) 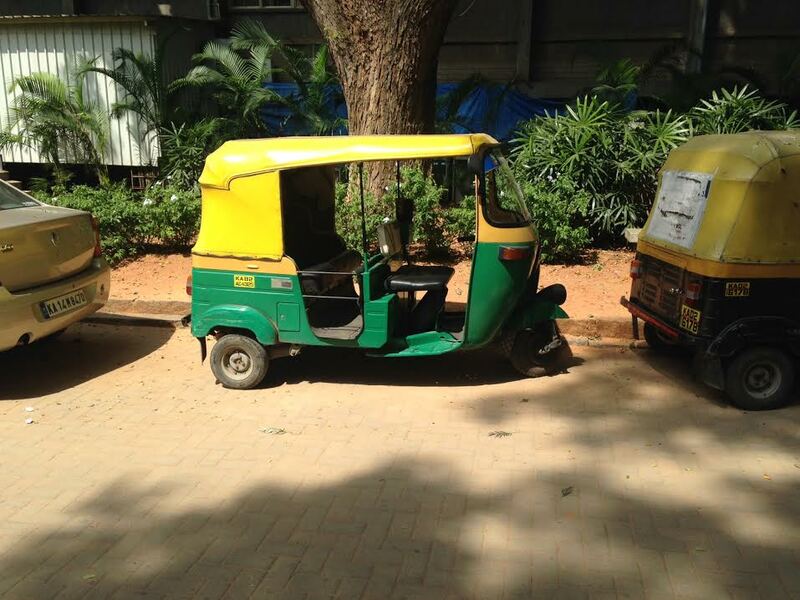 and my auto driver intentionally took me through a neighborhood I didn’t know so that he could run up the meter. But then you have the auto drivers who we like to call “Uncles” because they’re older, quiet, and fair. They let us practice our meager 2 phrases of language with them and smile in good humor when we mess up a word or don’t know any other responses. Today our auto driver made us pay 30 rupees more than what we know the meter should be, and then almost wrecked us because his tire blew out in the middle of the street (I have to admit…karma is a thing here in South Asia that a lot of people believe/practice that I do not agree with because it basically says what goes around comes around, and I know that I received grace when I didn’t deserve it, BUT in that moment I had the brief thought that his tire blew out because he overcharged us). But as I watched him timidly get out and look at us with embarrassment , I had compassion on him. He quickly began changing the tire, with Nathan’s help, and I realized he’s just a hard working man who’s trying to make a living, and he doesn’t know the Truth. I’m not saying that makes it okay to overcharge us (although he didn’t trick or cheat us per-say..we did agree to the price before hand), but I am learning that there are times to stand up for myself and times when I can show others the grace I’ve been shown. I’m also learning that #whitegirlproblems are real..and they have nothing to do with my rhythm or beat (which with all the Bollywood here, will hopefully improve). So while life here sometimes does drive me crazy (literally, and figuratively depending on who I ride with), it’s definitely an adventure that I’m excited to share with you. Many thanks for the update!!!! Love you sooooooo much & …………..